The meeting was a G20/B20 joint event aiming to contribute to the strengthening of a global digital agenda for development by gathering representatives of the public and private sectors to discuss the most relevant issues of the New Digital Economy. The event was hosted by the National Ministry of Science, Technology and Productive Innovation. The main topics discussed included digital inclusion, Industry 4.0, the impact of technologies such as artificial intelligence and big data in the production of manufactures, food and environmental sustainability, knowledge-based economy, creative industries, the digital gender gap and the transformation of the public sector. Opening remarks were made by B20 Chair, Daniel Funes de Rioja, Andres Ibarra (Argentine Minister of Modernization), Lino Barañao (Argentine Minister of Science, Technology and Innovative Production) and Mariano Mayer (Argentine Secretary of Entrepreneurs and SMEs). “We are living a unique moment in the history of humankind, the digital revolution and the production and control of information imply great responsibilities on a government level” said Lino Barañao. “This meeting is another example of the Argentine government´s commitment to participate in mutilateralism, of global governance. Digitalization is essential, we must take the regulatory measures to help it become a great opportunity” stated Andres Ibarra. The first panel featured Jacobo Cohen Imach (Digital Economy & Industry 4.0 Deputy Chair and Senior Vice President & General Counsel at Mercado Libre), María Inés Baqué (Argentine Secretary of Management & Public Innovation) and Rudi Borrmann (G20 Digital Economy Task Force Chair & Argentine Undersecretary of Public Innovation). They discussed the main topics regarding digital economy and industry 4.0 selected by the G20 member countries. 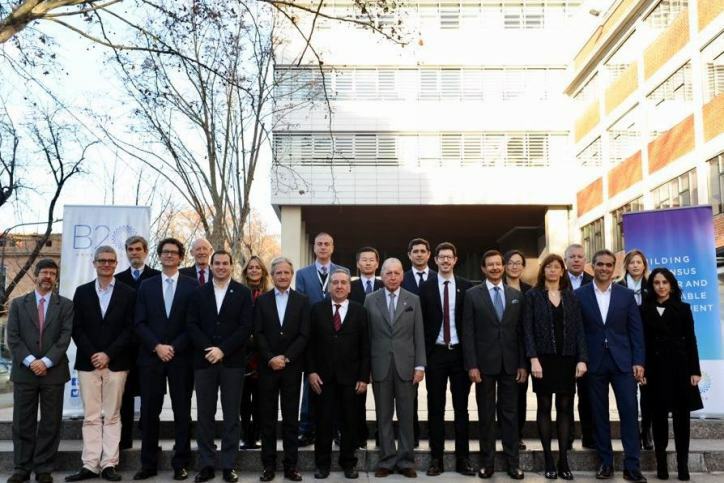 “We must ensure there is a collaboration between public and private sectors and allow upskilling for today´s challenges” said Jacobo Cohen Imach. The second panel focused on “Transforming Industry, digitalization and its impact” and included Pablo Di Si (Digital Economy & Industry 4.0 Co-Chair and President & CEO, South America, Central America and Caribbean Region at Volkswagen), Deep Kapuria (Digital Economy & Industry 4.0 Co-Chair and Chairman at the Hi-Tech Group), Adrián Magra (Regional Director, Digital Factory & Process Industries and Drives at Siemens), Ichiro Hara (Director of the International Affairs Bureau, Keidanren, Japan Business Federation & Sherpa of B20 Tokyo Summit) and moderation by Sergio Kaufman (B20 Knowledge Partner and President at Accenture Argentina & Hispanic South America). The third panel was moderated by Mariano Mayer who presented the experiences and work of seven Argentine entrepreneurs. The event also featured the presentation of three invited speakers. In the first place, Robert Pepper (Head of Global Connectivity, Policy and Planning at Facebook) talked about the regulations and standards requiredto develop global connectivity and develop telecommunications infrastructure: “Digital economy is essential to the future of every country. Social inclusion is key, it is important that we not have a digital divide”. Been Kim, Research scientist at Google Brain followed, showcasing her work with machine learning models and the complex tasks they can perform on the basis of software programming. Philip Evans, Senior Advisor for Disruptive Technologies at Facebook, focused on the technological tendencies and the new digital disruption: “In the last few years the real world and the virtual world are converging and are becoming the same thing. Data is essential, AI systems think in a way that is dependent on data. It is the data that has enabled the development of AI. Whoever owns the data, owns the AI”. Later in the afternoon, 4 thematic workshops were held on “Digitalization of SMES, Fintech & Digital trade & Data Flow”, “Development and Uptake of Industry 4.0 Technologies”, “Digital Skills & Gender” and “Digital Infrastructure for inclusion”. The workshops constitute a true public-private dialogue initiative between G20 and B20, since G20 delegates and B20 members dedicated the afternoon to interchanging views and ideas on the issues addressed.